He said the administration was in support of any form of restructuring that would benefit Nigerians. Osinbajo stated this while addressing traditional rulers from Ekiti State at the palace of the Ewi of Ado-Ekiti, Oba Rufus Adejugbe, on Wednesday. His Senior Special Assistant on Media and Publicity, Mr. Laolu Akande, made the transcript of the Vice-President’s speech available to journalists on Thursday. Osinbajo said Nigeria needed peace more than any other thing at this time. He berated those who he said derived satisfaction in ethnic and religious politics in order to divide the country. He said Nigeria was better off as a united country. The Vice-President said, “I want to say that this country is strongest, this country is best when we are one, when we are united. It is a united country that can make a difference. We are fully in support of any form of restructuring that will benefit the people of our country. 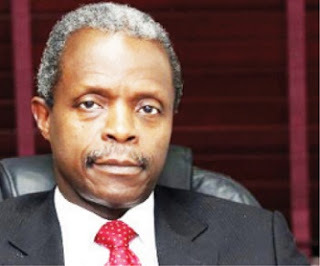 Osinbajo noted that there was nothing politicians would not say especially as the nation approaches elections. He, however, said the present administration was committed to keeping the nation as one and ensuring that no life was lost during electioneering. “But we believe very strongly that keeping our country together, keeping our people as one, and ensuring that no life is lost in the process of the elections is so important to us,” he added. Osinbajo said President Muhammadu Buhari was committed to the development of all the states of the federation irrespective of the political party in charge of the states. He said that was why Ekiti State had been benefitting from the Federal Government’s Social Investment Programme despite being a Peoples Democratic Party state. He cited the N-Power programme under which he said 3,339 young graduates from Ekiti State had been employed. He said the beneficiaries had been assisting the state as teachers, extension workers and health workers. Osinbajo disclosed that additional 8,600 graduates had been pre-selected and would be engaged at the end of this month, therefore bringing the number of beneficiaries in the state to 11,000. The Vice-President added that 10,664 beneficiaries from the state had also received micro-credit from the Federal Government of Nigeria under the SIP. Another 10,688 people, he said, were benefitting from the Conditional Cash Transfers in the state by receiving a monthly benefit of N5,000. “These have been done, as I said, because the President’s view is that we must not play politics with the health and welfare and prosperity of our people. No politicking. “That is why despite the fact that this is not an APC state, all of these benefits have been given to these people, the indigenes of this state because they are Nigerians,” he said. Osinbajo expressed the belief that if the candidate of the APC, Kayode Fayemi, was elected the state governor in the July 14 governorship election, the state would be better for it. He said the country needed devoted and serious-minded people to be in the saddle. “I want to say that nothing comes easy; you need people who are devoted, people who are serious-minded, dedicated to the work of improvement and development. That is what our country needs today. Meanwhile, a former president of the Nigeria Bar Association, Olisa Agbakoba, President-General, Ohanaeze Ndigbo, John Nwodo and Niger-Delta Activist, Anko Briggs, have taken a stand for restructuring. According to a statement jointly signed by the Convener of the Group, Dr. Goke Omisore and the Chairman, Media and Publicity Committee, ‘Deji Osibogun, the programme will be chaired by Consultant Physician and Endocrinologist, as well as co-founder, Eko Hospitals, Dr Sunny Folorunso Kuku. Other speakers expected at the event, which will hold at the Nigerian Institute of International Affairs, Victoria Island, Lagos, include Social Entrepreneur, Toyosi Akerele-Ogunsiji; Col. Tony Nyiam (retd. ); son of a former Nigeria Prime Minister, Abubakar Tafawa Balewa, Dr. Abdul Tafawa Balewa; International Trade and Investment Lawyer, Nathasha Akpoti and Secretary-General of Lower Niger Congress, Comrade Tony Nnadi.